I went to a place that I’ve only heard mentioned on the news, Dacula Georgia. Turns out it’s really not too far, straight out 316 about 20 minutes from where I live. The 20 minutes was well worth the drive to experience Rabbit Hill Park. 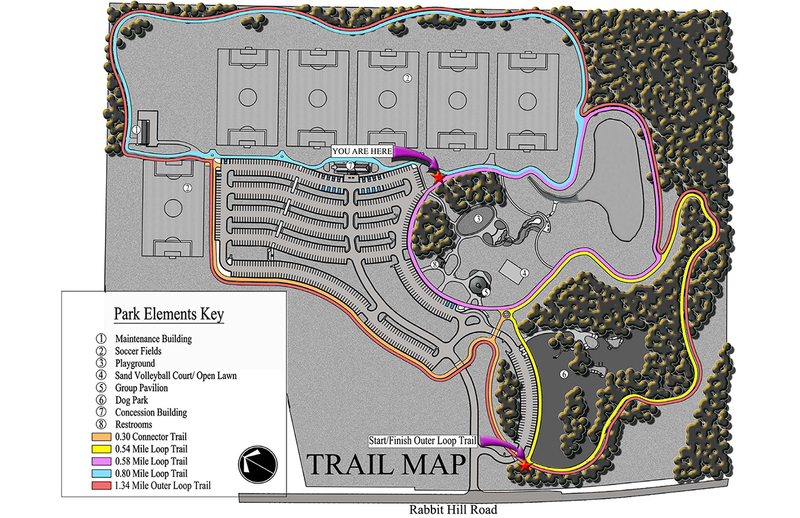 The park is split and runs on both sides of Rabbit Hill Trail and hosts an abundance of amenities. 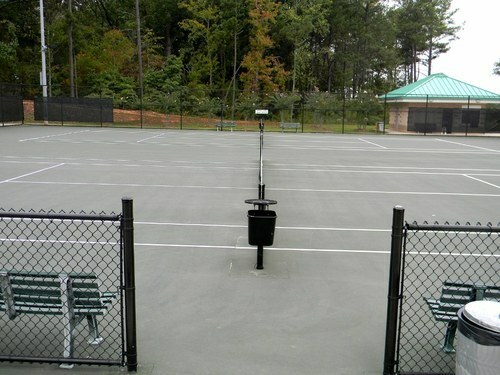 In the evenings the entire park is in use. 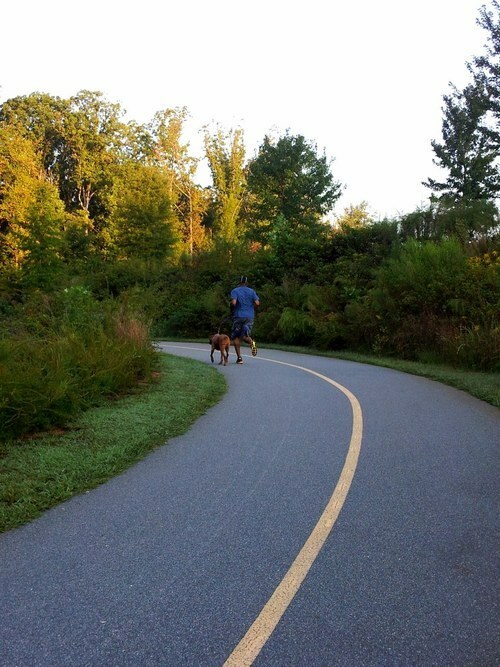 In the mornings, folks primarily make use of the trail and the dog park. What’s cool about the dog park is that it doesn’t allow for dogs and owners to mingle all willy-nlly. 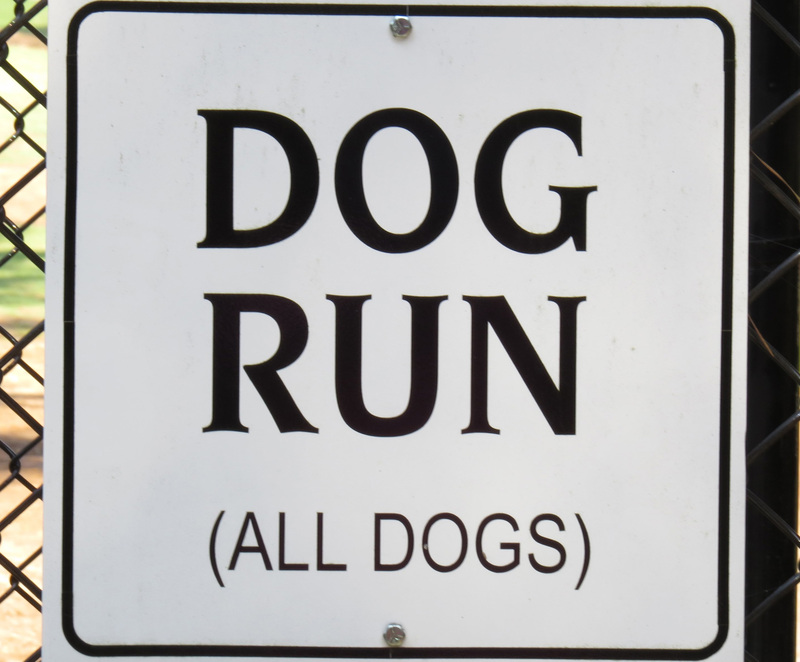 There are separate spaces for large and small dogs as well as a “dog run”. A few other notes on the trail to be mindful of: only the dog park side is marked, also both sides have stretches where there is no shade, i.e. you’ll cook but only briefly. Lastly neither side of the park is hilly, winding yes, some short inclines yes, but no hills. I’d say it’s perfect for getting in speedwork which I did see a guy doing but I didn’t photograph him as he was giving me side eye when we crossed paths earlier. I love this park. Rabbit Hill has something for just about everyone. 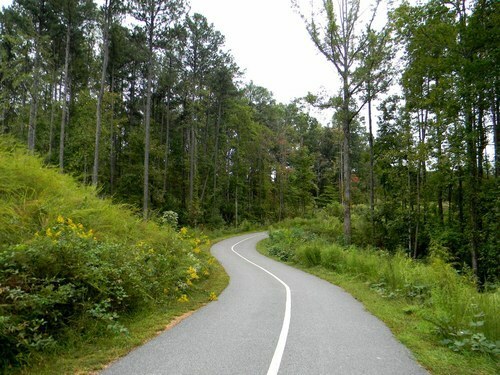 After having completed Peachtree, I really wanted to go out and run for the joy of it and Rabbit Hill Park is a great place to run/walk/bike etc. and enjoy the sights. 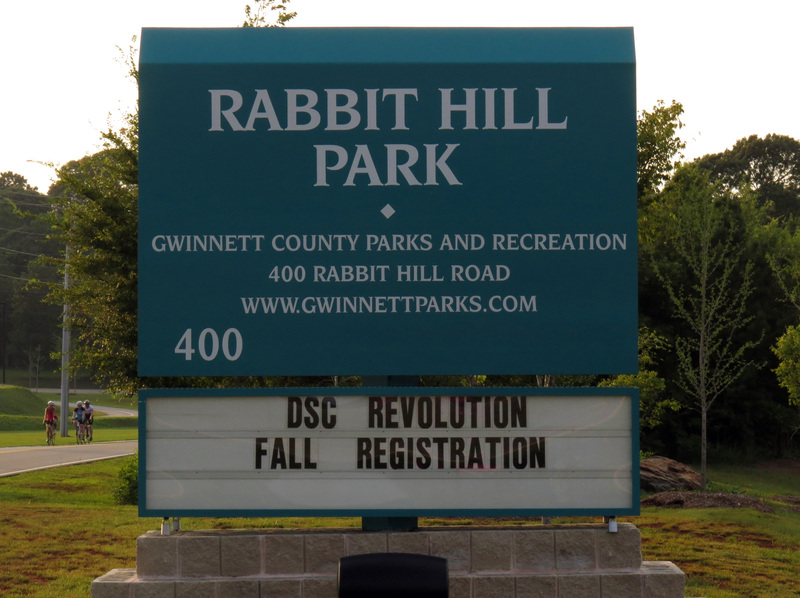 For more information on Rabbit Hill Park visit the website. For more photos, see the album on Google+. I moved to Atlanta from New Orleans. For my two years as a resident I had the joy of running through Audubon Park, a fast, beautiful shaded 1.8 mile trail near campus and my apartment. 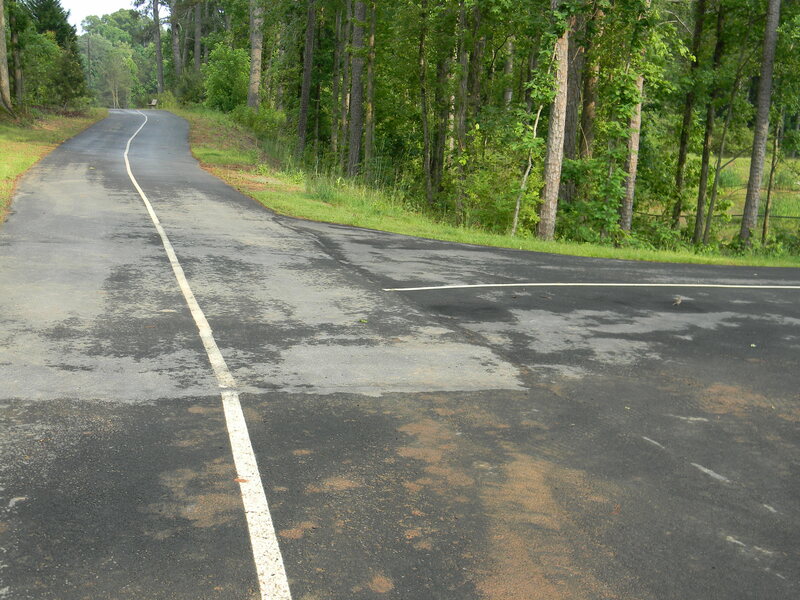 Coming to Atlanta was a rude for me as a runner, having started running through the flatness of Indiana, then in NOLA, I was dismayed with the hills of this new locale. Just the same I was determined to resume running somewhere and enlisted my BFF to find me a suitable park . 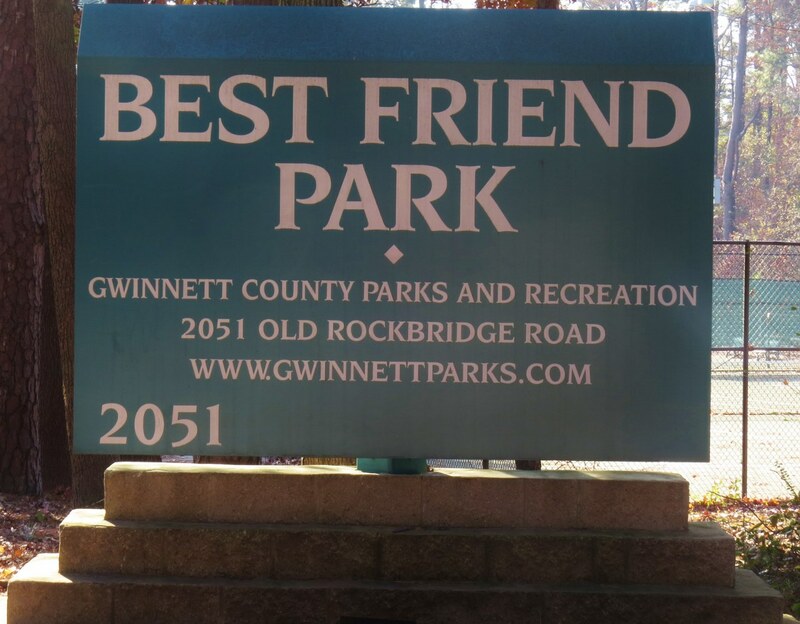 That first park was Best Friend Park. 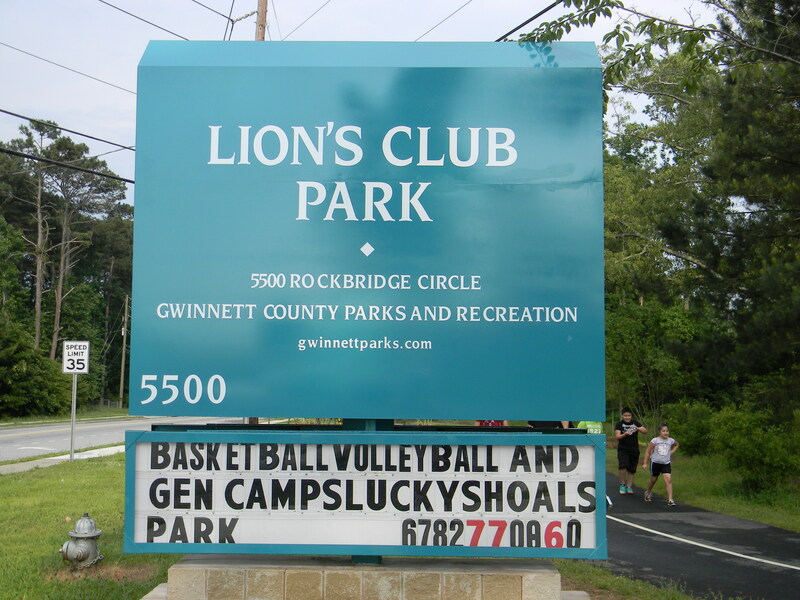 Located off Jimmy Carter Boulevard in Norcross, Georgia, Best Friend at that time (21 years ago) was more about hoops than it was about running and walking. Just the same, I gave the park a whirl found it less than desirable. I don’t believe that the trail was even finished at that time. Having run most of the parks in my area over the last few years, I recently headed back to Best Friend. Entering from Jimmy Carter and heading back toward the giant powerlines leads straight to the beginning of the trail. What I saw was a pleasant surprise, nothing at all like I remembered. The trail starts on top of a slight hill, winds down and back up near the tennis center. There’s a pedestrian crossing at that point as there is an entrance on that side. The trail continues past a field up another slight hill, curves around and ends back at the trail start. The trail is listed at .75 miles and it goes fairly quickly since it’s not hilly. The shade is adequate on the back side, but I imagine it may be pretty hot during the summer as you’re making the loop around back to the start as there are no trees on that portion of the trail. The Best Friend Park paved trail is a great, short trail that would be good for days when you don’t want to do anything long or difficult or if you want to do some speedwork amongst the trees in lieu of a track. If you’re in the area, check it out hopefully you’ll be as pleasantly surprised as I. 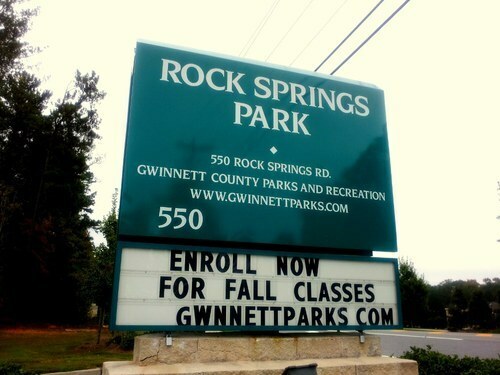 The last two posts here were reviews of Peachtree Ridge Park and Rock Springs Park. Both of which were quite an experience, both of which had some hills. Peachtree Ridge had fewer hills but those hills were very steep. I ran Peachtree Ridge on a Saturday and two days later (Monday) I ran Rock Springs which is very hilly throughout the trail. Later in the afternoon following the Rock Springs fun I noticed some pain in the front of my lower legs. Though it had been at least 15 years maybe more, I felt the pain of shin splints coming on. For my case the condition was a result of overuse and flat feet. Though this bout was really just the onset, considering my age I didn’t want to take any chances by continuing to run and felt it best to also see my doctor. The doctor did concur with my self diagnosis and suggested ice, rest and anti-inflammatory medication. One of the trainers at the gym suggested an exercise to stretch the muscles surrounding the shin bone. I opted for a combination, continuing my exercise regimen substituting a stationary bike for cardio and including more stretching every day. I took the anti-inflammatories for a couple of days and skipped the ice (I loathe using ice and only do it when pain and swelling is significant). There was no running whatsoever for eight days (it sucked but it as necessary). 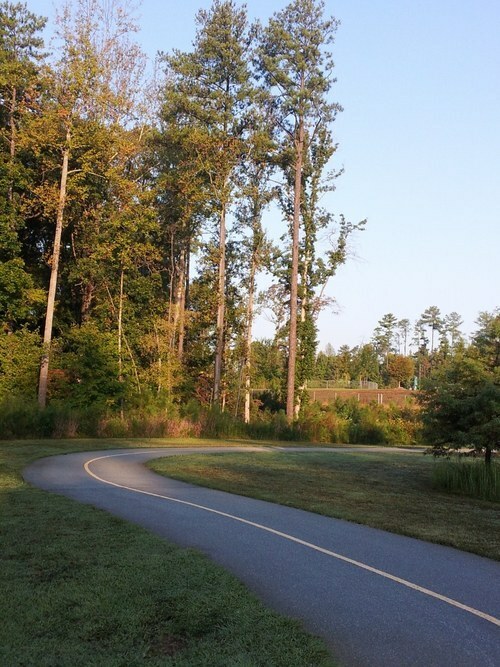 The running return took place at Camp Creek Greenway, which is a flat fast trail and that run as good. However following the run I examined my shoes and knew that they they were toast and were no good for this flat-footed runner. I haven’t been inside of an actual running store in forever, but this time wanted to get the fit right and get my running mechanics checked. The associate at Fleet Feet Sports in Decatur measured my feet in a neutral shoe and had me run on a treadmill and outside. His diagnosis, mild over-pronation that could be addressed with a stability shoe (which I had been wearing already, again though, they were toast) . I was thanking God almighty for this recommendation because motion control shoes, which are usually recommended for flat-footed runners are the most uncomfortable shoes (in my opinion of course) on earth. 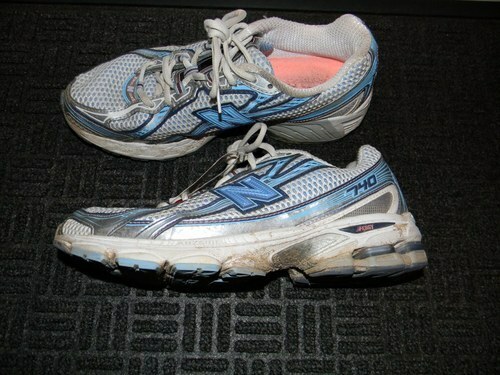 I broke them in with 5 miles at Bethesda Park on Saturday and they were fantastic. Also keeping in mind my form, I allowed the hill to carry me down instead of “putting on brakes” I recall specifically at Peachtree Ridge “braking hard” and letting my feet pound on the pavement, which was especially jarring to my legs and my lower back. I found a great post on active.com that addresses form for downhill running. A web search will provide video demos for downhill running form as well. Ego is a dangerous thing at times and it can lead to all sorts of problems, in this case injury. The most important thing when it comes to any sort of physical exercise or even going about your daily existence is to listen to the body and give it what it needs. If you’re experiencing chronic pain or a brand new pain, go see your doctor and get a referral if you need to so that you can get on the road to recovery as soon as possible. Until next time, see you on the road. With a week that was packed to the gills with stuff, I decided that a change of scenery would be good for the Saturday outdoor run. 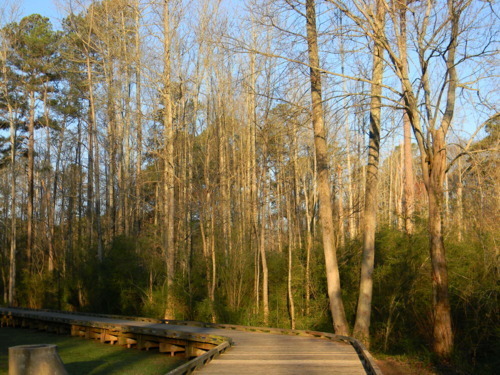 Having checked the Gwinnett Parks website, Peachtree Ridge Park in Suwanee, Georgia looked to be a prime candidate for this week’s run. I had a number of annoyances occur on Friday during the day job and a few more after leaving job two last night. Once I finally made it to bed, there was no real sleep, just moments of sleep in between some very bizarre dreams. By the time morning came I was relieved to see daylight and was looking forward to getting to the park. Getting there was quick an easy, traffic was on my side. It was cool out with a bit of dew on the grass, another plus. I thought, this is going to be a good one. On this morning run I managed to see it all, because I didn’t exactly follow the paved trail. 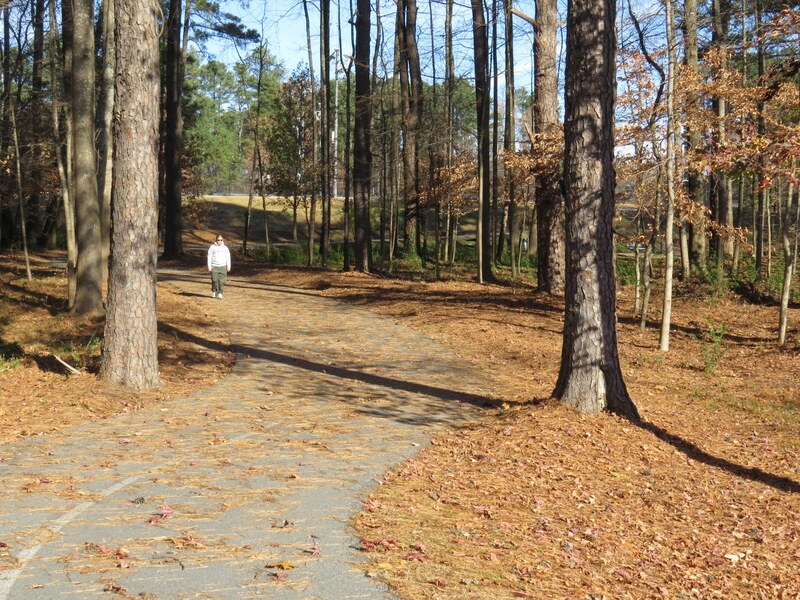 The paved trail was clean (goose-poop or trash) only the first few fallen leaves of the season were on the ground. I started at a pavilion next to a small playground and followed the curve towards what I thought was the back of the park. What I noticed was how far out some of the brush hovered over the trail, it was clearly in need of some cutting back. I took a trail the left, which made a small loop into a nice wooded area in which there was a small covered picnic area, which was really cute. During my second pass I saw a lady doing what looked to be Tai Chi with another lady and a dog that started yapping as I passed by (the dog was messing with my chi). Following the small loop I made another left and immediately regretted it. There was a steep downhill, on which I “put on brakes” to make sure I didn’t go to fast (yes even I’m fast on a downhill), which followed a manageable climb out. 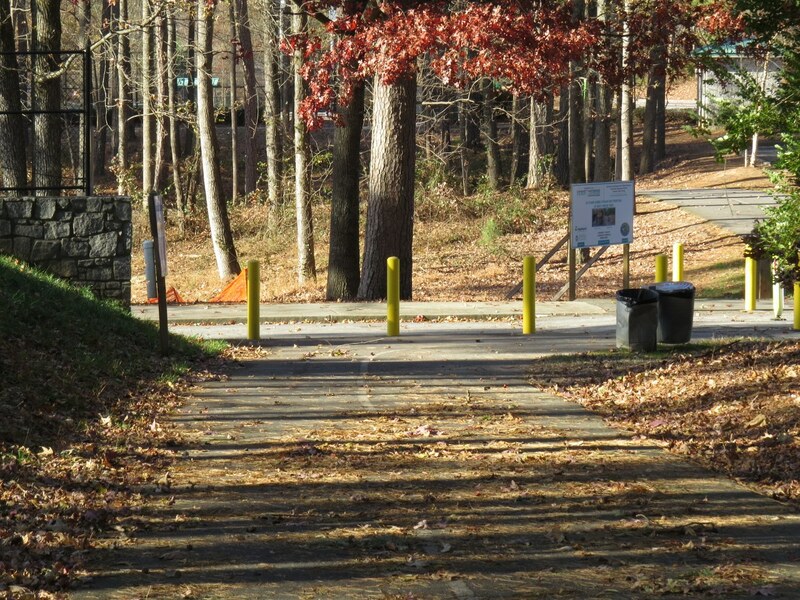 The trail leads to the football field and the walking track which surrounds it, but it’s not really a track. 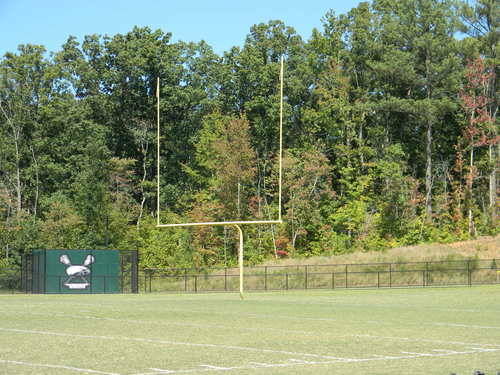 It’s a loop around the football field, paved and marked, like the trail. There was a pee-wee game going on with cheerleaders and everything (didn’t know they had cheerleaders at the little bitty kids games). As I wound my way through I was uncomfortable and it wasn’t just the brush or that hill, which I would have to climb on the way back. There was something urgent pressing… my bladder. which was clean had toilet paper and soap, thank GOD! I resumed my run, this time running through a small tunnel instead of the loop and followed the trail, again to the left and a funny thing happened, the trail ended in a parking lot, followed by more parking lots. This was fine because on this portion of the run I got to see a rabbit, the basketball courts, a large playground and the baseball and soccer fields. I made a loop through the parking lots and headed back to the trail. I said to myself, pick your feet up and watch the curb and I did , except all of my body went up. I FELL. My bracelet flew off and I landed on my tail facing the other direction. A passerby asked if I was alright and handed me my bracelet. I had a small cut scrape on my palm that was bleeding, but otherwise I was fine, a bit heated but fine. I’d planned to run for a certain amount of time, but by then, my mind was made up to run back to the car. I was out of there. Stopping 20 minutes short of my scheduled time for today, I decided to cut my losses. 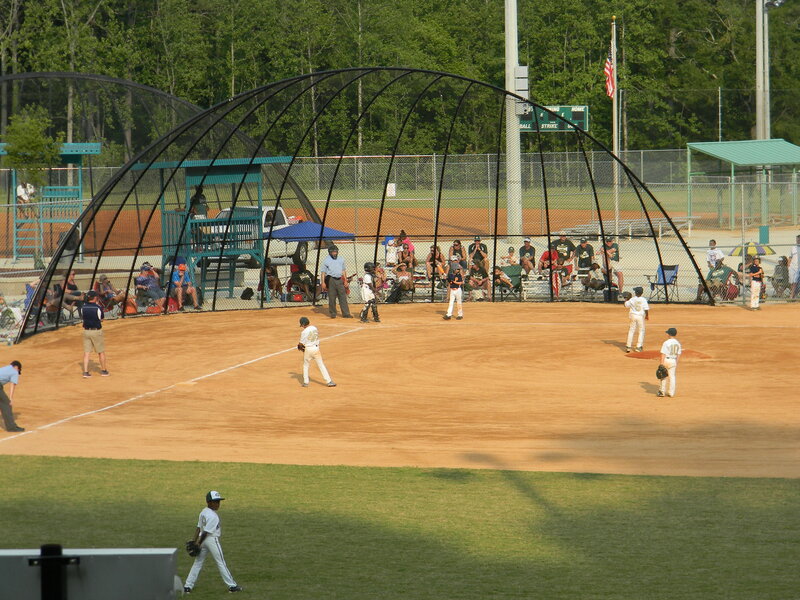 Peachtree Ridge Park is a great park for families, as there are numerous fields, play areas and open stretches of land that are conducive to play. The trail on the back side near the football field is a BEAST! If you like challenging yourself on steep hills this is a great place to do it. As for me, I’ve been there and done it. I won’t be going back to this park, though it’s fairly close, the experience unfortunately soured me on it. 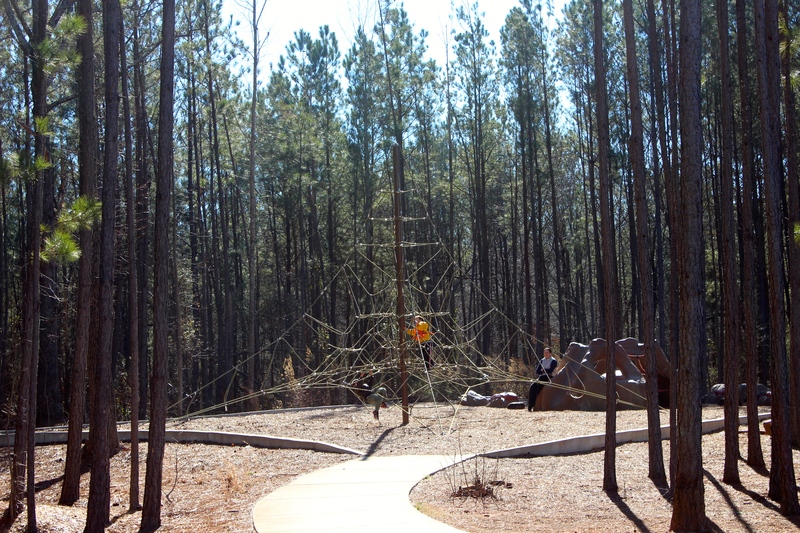 For more information on Peachtree Ridge Park, please visit the Gwinnett County Parks website. 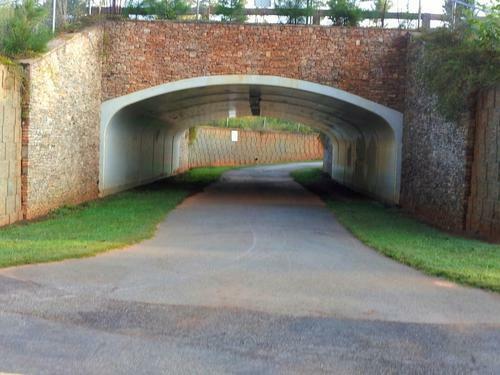 For the last few years, it’s been a tradition to go check out a new park following the Peachtree Road Race. 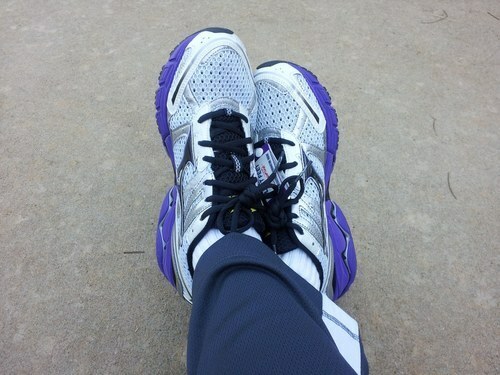 The purpose of which is two-fold, 1)finding a new spot to enjoy and to run in and 2)to exhale from Peachtree. 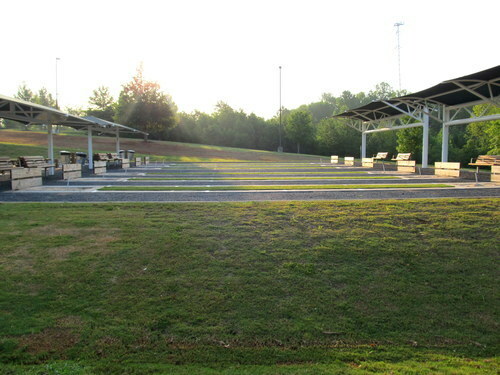 This year’s exhale took place at Gwinnett County’s Rhodes Jordan Park in Lawrenceville, Georgia. Rhodes Jordan Park at 100 East Crogan Street is nestled in downtown Lawrenceville and is built around Lawrenceville City Lake. 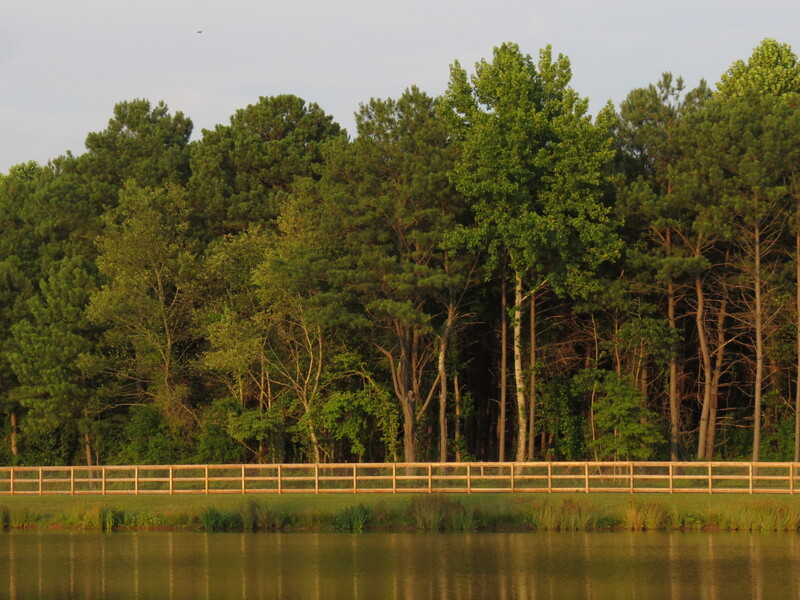 At a large 162 acres, nearly any activity you’d like to enjoy can be accommodated there. 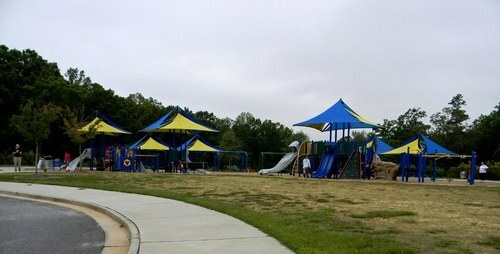 The park features: a community recreation center, community room with catering kitchen, classrooms, dance/aerobics room, fishing lake, pavilions, playgrounds, seven baseball/softball fields, football field overlay, outdoor leisure play pool, double gym, tennis center with eight lighted courts, outdoor baseball court, outdoor horseshoe court (the first I’ve seen at any of the parks visited thus far in the county) and a 1.9-mile paved multi-purpose trail. The beauty of the park is the lake and how everything is nestled around it. There is a an abundance of water fowl and in the early morning they pretty much have the run of the place, with their numbers decreasing as the morning heats up. 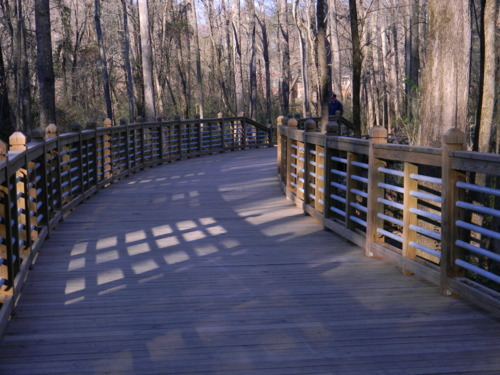 There are several boardwalks bordering and crossing over the lake as well as a secure railing on the low lying areas of the park. There’s also a variety of wildflowers, and especially lovely to see, butterflies. I visited the park in July and September and the visuals were spectacular in both cases, which is especially enjoyable while putting in the miles. 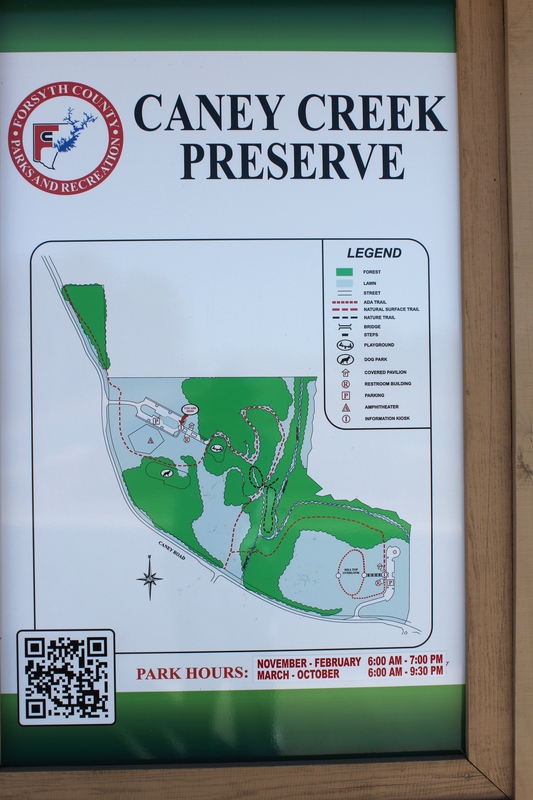 According to the park master plan there’s a network of trails totaling 3.8 miles. 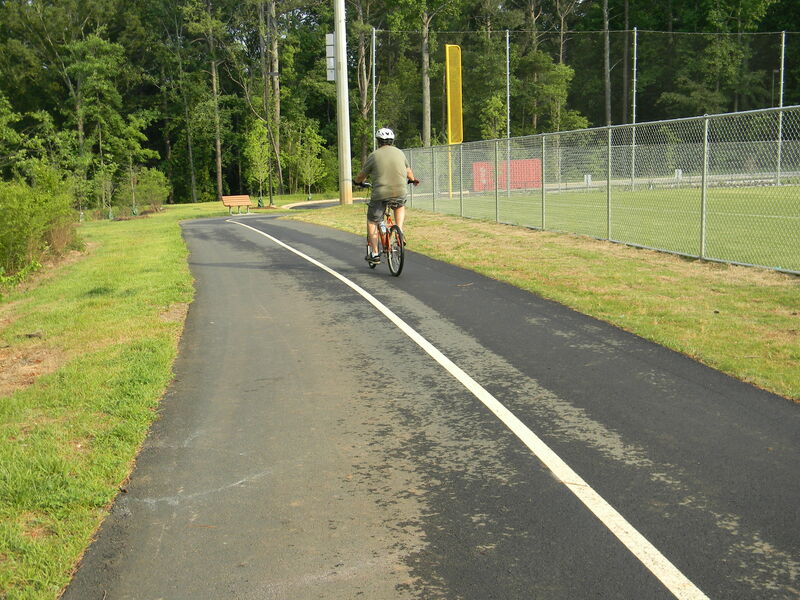 What’s actually paved, connecting and usable is closer to the 1.9 miles listed on the website and it is a fairly easy 1.9. 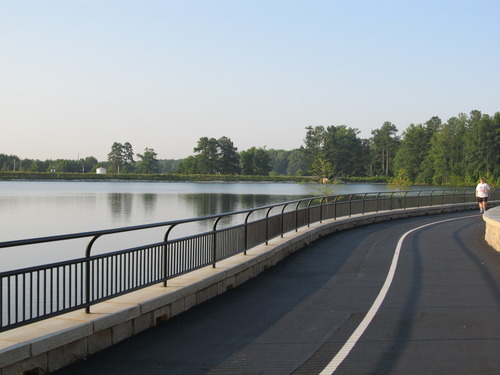 Taking the paved areas around the lake, behind the picnic area and near the horseshoe courts, will give you a nice crossing loop with minimal hills. The trail is not marked, which is fine. Those who keep track of such things as mileage (which obsessive runners like me do) can just do a timed run and do the math to arrive at mileage. 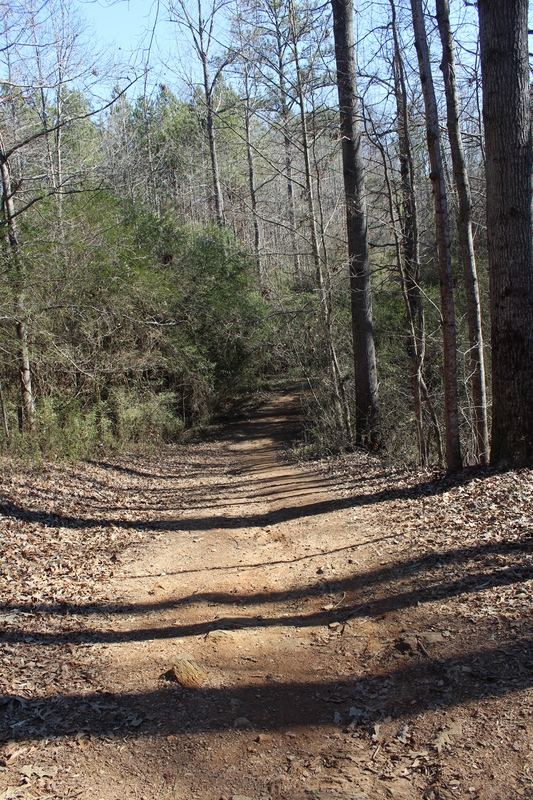 The trail is mostly shaded with only small sections bordering the lake open and you’ll feel the heat, only momentarily. The trail is really enjoyable because there’s a lot to look at and keep your mind off of how long you plan to be there, the relative ease of it is also good, for any distance or type of run (repeats, tempo). 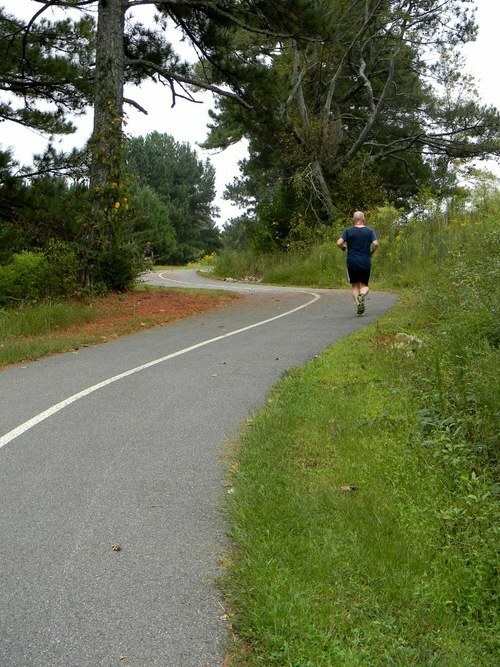 In fact yesterday I saw a young man doing hill repeats up a grassy hill to the trail. With all the beauty there is one drawback of the trail at Rhodes Jordan Park and that is the poop. 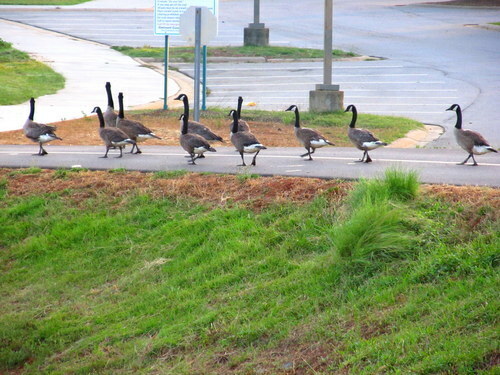 Waterfowl, especially the gigantic geese (and there are several varieties) we have here make poop that’s as big as dog poop and it is everywhere on the loop directly surrounding the lake, so watch your step. 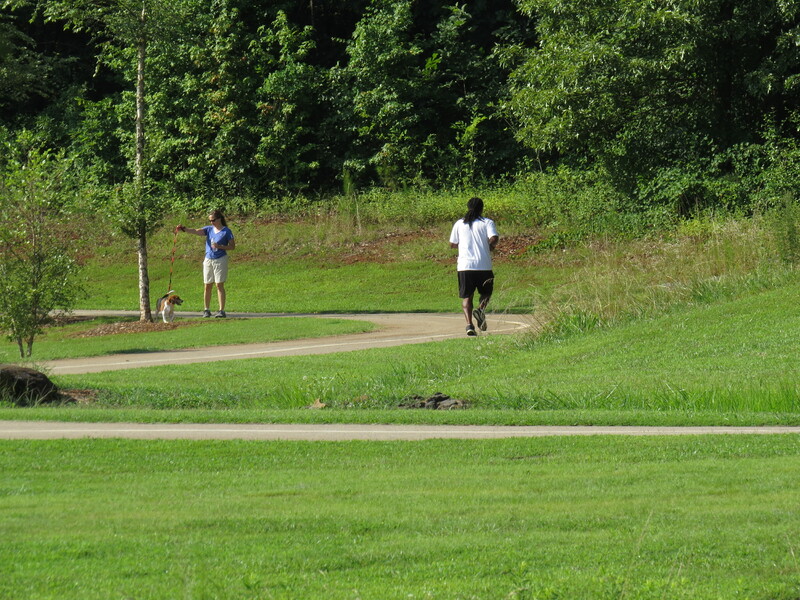 Rhodes Jordan Park is a park for everyone, there’s really no outdoor or indoor activity that one could not enjoy. 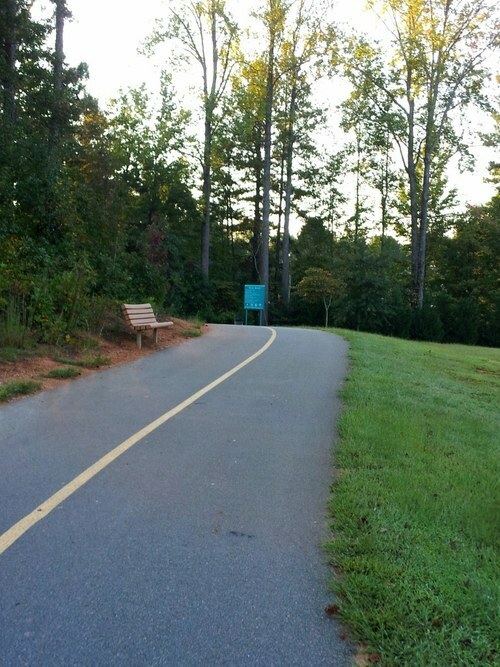 The easy, breezy trail is great for runners and walkers, and the park’s accessibility and aesthetic appeal make it great for days when you don’t want to do anything at all other than sit under a tree. If you’re in Lawrenceville, take a little time to enjoy this spot right in the heart of the city. Until next time, see you on the trail. I was out riding around looking for something compelling to take a picture of on that Sunday afternoon and ended up near a park that I’d been by before but had ruled out as there was no trail. Making a u-turn to go back the other way, I came across a sign for a Greenway. My heart started beating fast, because this one, if it was real, was close to where I live. I couldn’t figure out how to get to it and on the second access attempt, landed somewhere on this mysterious trail. Turns out I’d just located the Camp Creek Greenway. 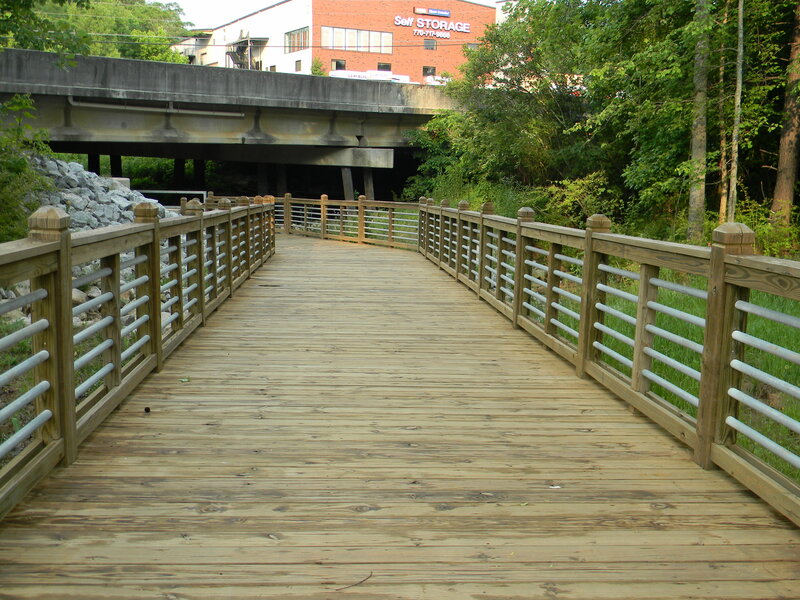 Camp Creek Greenway runs along Camp Creek through the city of Lilburn Georgia. 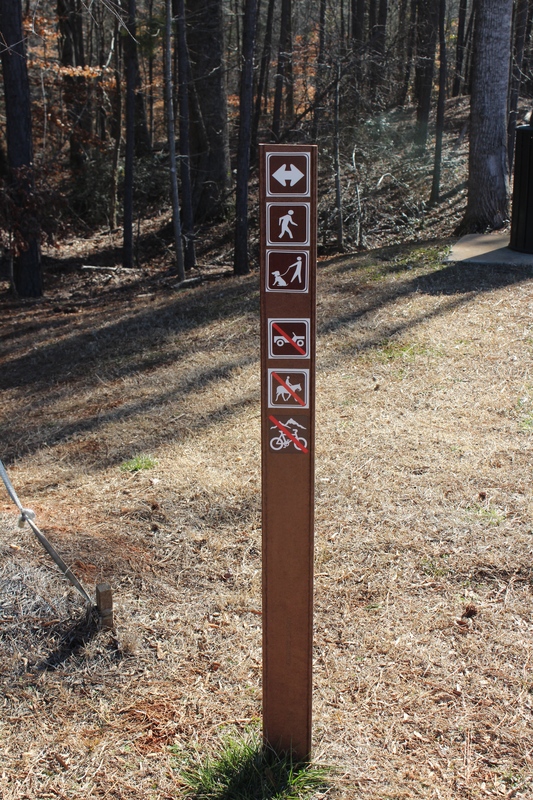 A gentleman on the trail informed me that parking for the trail was at Lilburn City Park where I’ve been on numerous occasions, not knowing that a sizeable trail ran right through it. Where I landed was basically on the short forked end of the trail, where Greenway and Spur Trails meet. I decided that the next weekend I would come back and check it out. Last Sunday I parked across from City Park and walked what I’ll call the main/long trail. Regulars along the route indicated that from the start and back was about 2.6 miles and it was absolutely 2.6 miles of loveliness. I still wasn’t satisfied because I had not seen all of the trail at once, plus I had yet to run it. Now for the WHOLE trail (running). I made it back on Saturday the 10th. The morning was cold, frosty even, but clear with little wind. 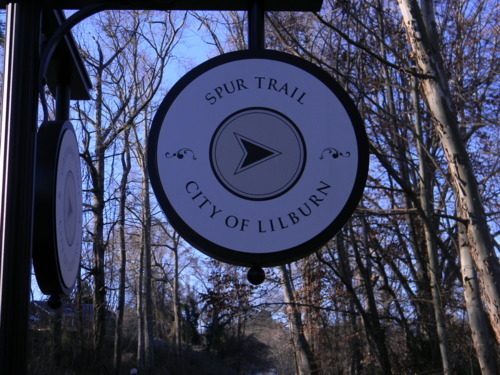 I started in the City Park parking lot headed towards the fork and bore right on Spur Trail which has a nice boardwalk and a pretty decent incline to Killian Hill Road. Running back to the fork and then onto Greenway Trail I crossed a short boardwalk that had a bit of ice (the folks on the trail are really friendly and a lady warned me of the ice before my approach). I ran through this trail which ends at Poplar street and turned back. Running through the park, across Main St onto the main/long portion of the trail, I crossed several short wooden bridges and a longer boardwalk, with bits of ice. The trail ended at Rockbridge Road. Turning back and completing the run in the parking marked roughly 4.4 miles. 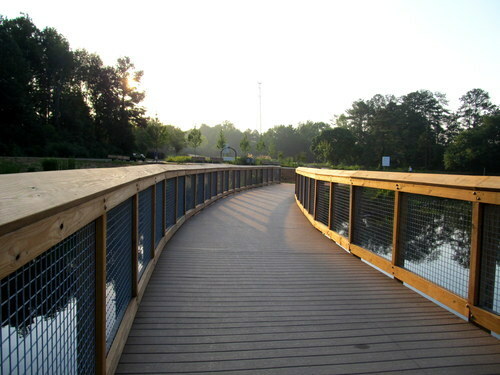 Lilburn’s Camp Creek Greenway is really a gift for the area. Some folks may not like the out and back routes to get mileage in, but for me, it’s worth it for the scenery, which is absolutely beautiful and because it is relatively flat and fast. 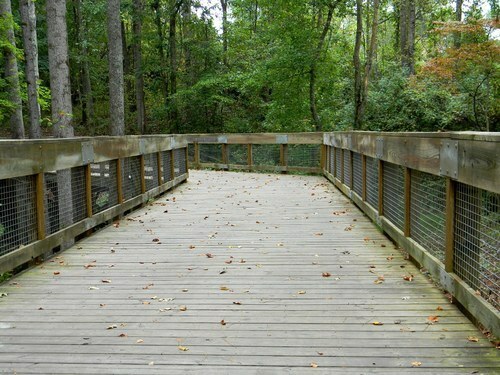 The few caveats are: ice on bridges and boardwalks; mud on the main trail (about a 4 ft section of it) after major rain and; finally for allergy sufferers, this trail should probably be avoided during peak allergy season in late March and April. There are signs that indicate that pollination is encouraged and no grass cutting or insecticides are allowed in certain areas. Still I highly recommend it for those that beautiful scenery, friendly people and a fast route. Photos by Michelle A. Thorns. View the full set here. It’s been a very mild winter in Georgia and having a weekend off I had a bit of time to go and look for another park. 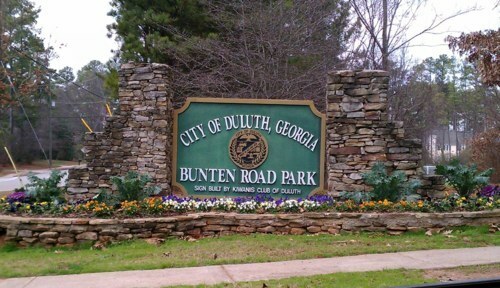 Because I didn’t want to drive too far in Gwinnett I turned to one of the city maintained parks in the area that was relatively close by, Bunten Road Park in Duluth. 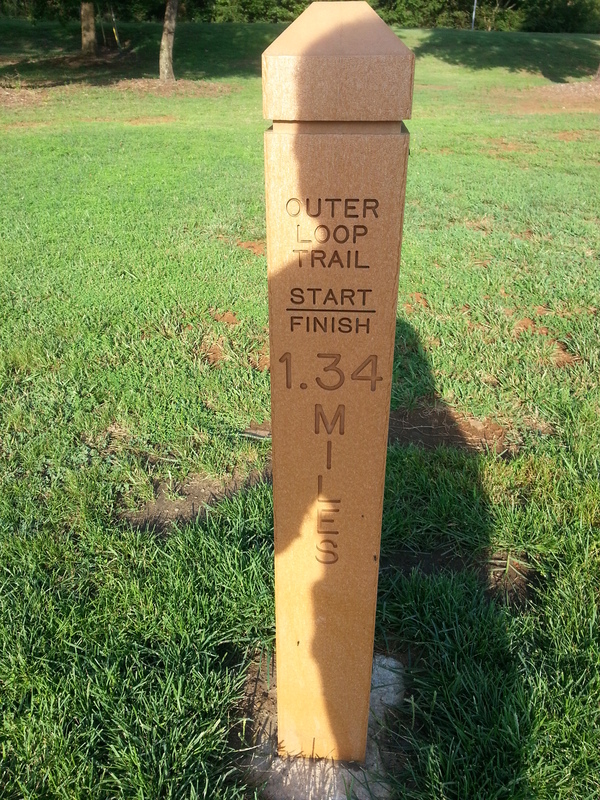 The trail loop is a fast 1.08 miles. 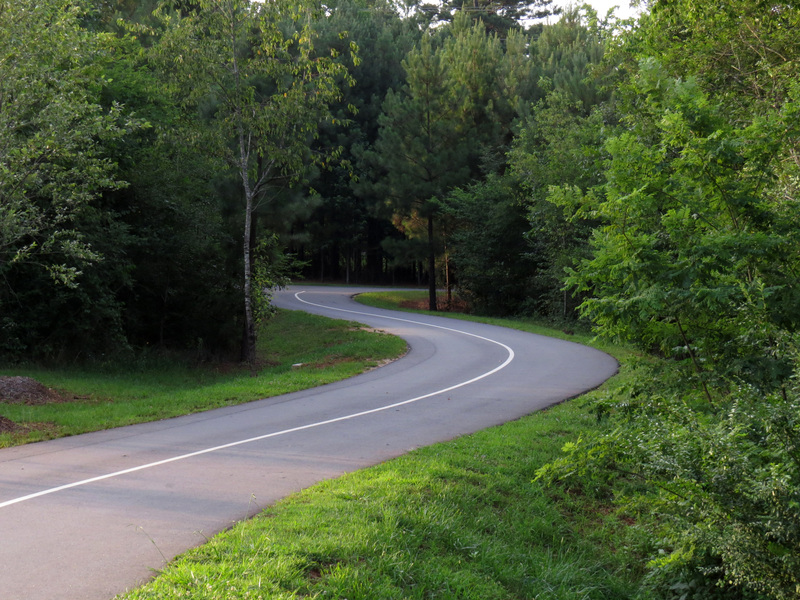 The wooded portion of the trail is really curvy but the distance of those curves is really short. That curvy portion also contains the only hill. Even with the wind whipping that day I had no problem covering it, in fact this turtle felt pretty fast on this course. 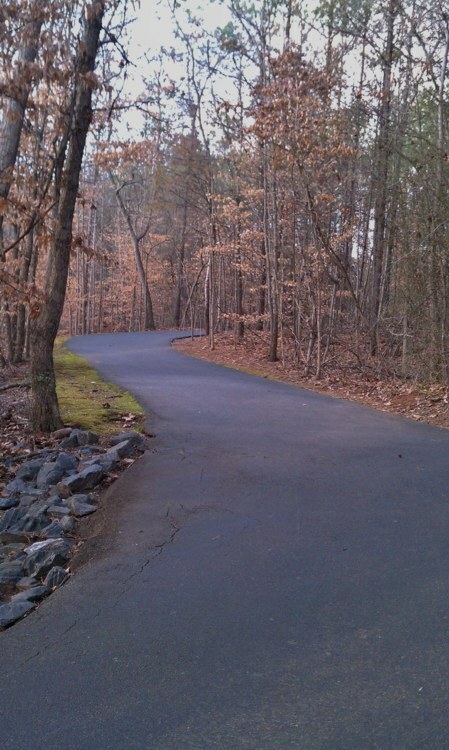 Overall Bunten Road Park is a nice well-maintained park with a trail that is perfect for short (5k) training runs. If you’re in Duluth I suggest you give it a whirl. For more photos, see the Bunten Road Park Album on Google+.